Located in the Nairobi section across from the train station, Jambo Junction was home to a number of animal ambassadors and newborns with often changing exhibits and habitats. It was closed in late 2016, and reopened in 2017 as the re-branded Animal Connections. Part of a $250,000 revitalization project in late 2007, the Nairobi Field Station received upgrades and enhacements to house some of the theme park chain’s animal ambassadors. Often touring the country and stopping at schools or appearing on television, the trained animals were normally kept behind the scenes when not traveling. The plan was to have approximately 30 of the animal ambassadors in Jambo Junction and the attraction open by Christmas 2007, with about 60 calling the attraction home by June of 2008. The parks at the time had a collection of about 100 that were trained as animal ambassadors, about half of which were raised in captivity. The other half were rescues, often from owners who had them as exotic pets but were unable to care for them properly. Species represented included coatimundi, lemur, anteater, skunk, and a variety of birds. Busch Gardens’ Nairobi Field Station has undergone a transformation to allow greater interaction between guests and the park’s animal ambassadors. The new area, which will open to the public this weekend, is called Jambo Junction – a name inspired by a Swahili greeting. 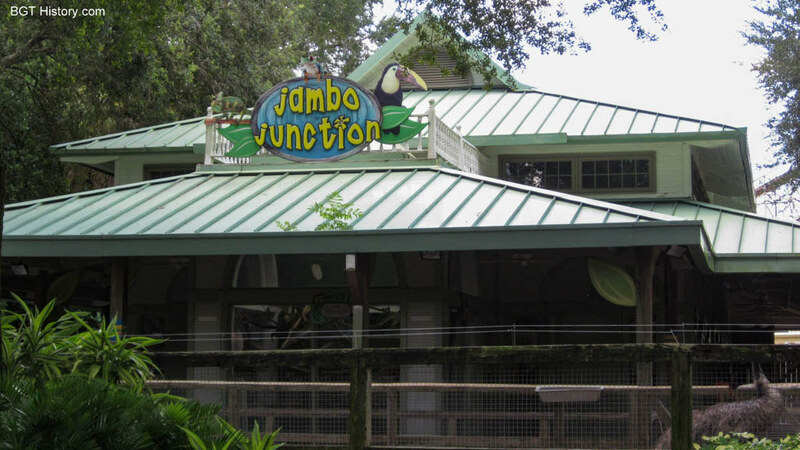 Jambo Junction uses the existing field station infrastructure to create a new, interactive attraction. The conversion includes a walk-through station, expanded outdoor habitats and more animal presentations. At Jambo Junction, guests will have the opportunity to participate in animal feedings, lessons in husbandry and behavior training. Featured animals include Caribbean flamingos, lemurs, cuscuses, sloths, opossums and baby animals. This area is also the permanent home for Busch Gardens’ animal ambassadors. Animals in the ambassador program travel nationwide for educational presentations in schools, community events and media events. Each animal ambassador’s name and fun facts will be introduced to the guests. Jambo Junction had a mix of both permanent animal ambassador residents along with temporary ones, including newborns, animals being rehabilitated, and new additions to the park’s collection that were housed there before being moved to their own habitats. As part of holiday festivities at the park, kids were invited to stop by Jambo Junction on December 24 and 25, 2010 to make an animal ornament to take home as a souvenir. On December 26, guests were invited to help make holiday themed animal enrichment. On April 16, 2011, a male cheetah cub and his new yellow lab puppy companion were added to the Jambo Junction lineup. They were eventually moved to the new Cheetah Run habitat. At the end of August 2011, the newest addition to Jambo Junction was introduced – a five month old fennec fox. Later in the Fall, the park introduced four Jambo Junction residents to the animal ambassador program – native Florida pine snakes Slash and Spruce, and Rex the Florida kingsnake, and a Saharan uromastyx. Slash and Spruce were both hatched at the park in October of 2007, Rex arrived as a rescue in October 2002, and the Saharan uromastyx hatched in April 2011 and was later moved to the park. The newcomers joined the other reptile animal ambassadors, including Ybor, a Cuban iguana, Marla, a leopard gecko, and Oscar, the blue tongued skink, for close-up encounters on the pathways nearby. In December of 2011, on Fridays and Saturdays from the 9th through the 24th, guests were invited to join Education and Conservation Department for Jolly Times at Jambo Junction from 1 to 3 p.m. Activities included creating enrichment for the animals, coloring ornaments to take home, and up-close encounters with animal ambassadors. In February 2012, guests were introduced to new animal ambassadors, a male and female short-beaked echidna. The male was around one year old at the time, and the female around six months. Echidnas are one of only two types of mammals that lay eggs. Around this time a female Reeves muntjac named Samantha retired to Jambo Junction. She had previously served an important role as a companion animal for young hoof stock at Busch Animal Outpost, the park’s private reserve in Dade City. An open house was often held at Jambo Junction. A park blog post in March 2012 shared that it occurred daily from 1 to 2 p.m., and allowed guests to come inside the building to get a closer look at the facilities and animals housed there, along with a special encounter with an animal ambassador, like Rainbow the macaw, Mario the sloth or Fez the fennec fox. New on exhibit as of April 2012 were Halloween crabs, native to the rainforests of Central America. The uniquely named crabs spend most of their time on land and forage mostly at night. On March 30, 2013, a one time special event called Reptile-Palooza was held at the park in celebration of two new species in the reptile hall of Jambo Junction. A Gaboon viper and Chinese crocodile lizards were recently added to the exhibit. In addition to special sessions at Jambo Junction, animal care experts also held presentations about reptiles in Edge of Africa, Jungala, Morocco, and Nairobi. In August 2013, the park introduced guests to Batari, a two year old female Komodo dragon visiting from the Los Angeles Zoo. Batari could be seen in her habitat in the reptile section of Jambo Junction. Many of the smaller animals born at the park were housed for at least awhile at Jambo Junction, and often would be placed on exhibit there as well. Below is a list of some of the small animal births at the park while Jambo Junction was open. May 9, 2009 – A male southern ground hornbill named Tufts is hatched. He joined his older brother Barakas at Jambo Junction as an animal ambassador. December 23, 2009 – A male giant anteater is born to mother Adelhi. The newborn weighed approximately 3 pounds, and would spend about four months riding on his mother’s back before walking on his own. January 16, 2011 – A male Mexican beaded lizard named Gaspar is born. He is on exhibit at Jambo Junction until reaching maturity, when he is relocated to Curiosity Caverns with four other beaded lizards. April 10, 2011 – A male aardvark named Zawadi (Swahili for gift) is born to mother Izzy and father Friz. Animal care staff stepped in and decided to hand rear Zawadi after they noticed Izzy not being attentive to his needs. April 29, 2011 – Two red ruffed lemurs are born to mother Maditra (meaning stubborn) & Bozeny (meaning very little), better known as Madi & Zeny. The new lemurs were moved to SeaWorld San Antonio in November 2011 to serve as animal ambassadors there. February 5 & 6, 2012 – Two emu chicks are hatched, the first births at the new Animal Care Center next door. The chicks would be moved to Jambo Junction shortly after, and later named Eli and Emma. March 26, 2012 – A female aardvark names Adazee is born to mother Izzy and father Friz. At the time, it was noted that there were less than 40 aardvarks in North American zoos, and births are not common. Adazee weighed in at 4.8 pounds and was expected to grow to more than 120 pounds in her first year. June 21, 2012 – A three banded armadillo is born to mother Zowie and father Ollie. February 15 & 19, 2013 – Two male Southern Ground Hornbills are hatched. They go on exhibit at Jambo Junction on March 13, 2013, where their older brother Tufts and uncle Baraka can also be seen. April 13, 2014 – A southern tamandua (lesser anteater) is born. April 27, 2014 – Southern three-banded armadillo is born to mother Zowie and father Ollie. March 24, 2016 – A male Hoffman’s two-toed sloth is born to mother Grizzly. age 32 and father Teddy, age 41, weighing just 6.6 ounces at birth. The animal care team noticed the baby was not nursing regularly, and made the decision to hand-nurse the baby, using a syringe every two hours around the clock. The keepers chose Kodiak (nicknamed Koda) as the baby’s name, keeping the bear theme like his parents. April 2, 2016 – A female Linne’s two-toed sloth is born to first time mother Daisy and father Mario. It weighed 19.4 ounces at birth. Facebook fans chose the name Yiscel, meaning beautiful girl. The other choices were Lily (meaning majesty and honor) and Iris (meaning hope and friendship). Additional details and images for Jambo Junction will be added in the future.